Like prior Air Jordans, the design of the Air Jordan 22 (XX2 or XXII) was inspired by a work of art off of the court. Previous models were designed after such things as Michael’s own Ferrari, the X-15 fighter jet, and even the P-51 Mustang. The Air Jordan 22 (XX2 or XXII) took inspiration from one of the most advanced fighter jets in the world – the F-22 Raptor. Like Mike, the F-22 Raptor is equally as threatening offensively as defensively. Combine the F-22’s speed of 1600 mph as well as being a stealth jet and you have paralleled qualities Mike had on the court. The design of the upper has sharp lines which takes inspiration from the sharp maneuverability of the F-22 Raptor. The Air Jordan 22 (XX2 or XXII) features zig-zag stitching similar to that of the F-22 which helps conceal the jet from enemy radar. On the shoes, this stitching helps provide a well produced shoe with lasting quality. Lastly, one cannot miss the distinct yet stylish 3M reflective material on the back of the shoe which lights up the court in the lowest level of light. The Air Jordan 22 (XX2 or XXII) incorporates several crucial properties providing the athlete with the best fit and protection. The shoe boasts the best ankle history of any Air Jordan to date. The shoes have a variable speed lacing system coupled with titanium lace loops as well as a durable titanium lace lock. Next, the Air Jordan 22 has air vents like the F-22; however, rather than being used for stability while flying at Mach 2.4, these vents provide an escape for heat. The heel on the Air Jordan 22 (XX2 or XXII) is like no other. The diamond shape and extended heel counter protects even the most vulnerable athlete from a rolled heel. 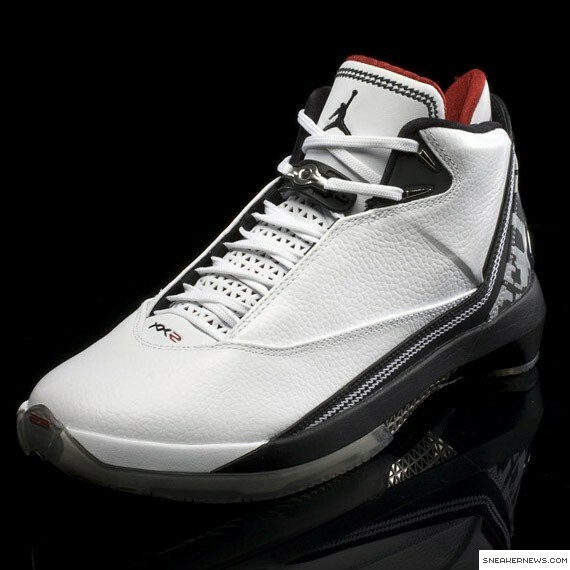 Lastly, in the past the Air Jordans have had a carbon fiber shank plate to provide midfoot stability, but for the Air Jordan 22 (XX2 or XXII) the shank plate is made of titanium. This shank is not only stronger, but also lighter weight. Oh yeah, the atomic number for titanium (Ti) is 22. The Air Jordan 22 (XX2 or XXII) takes with it the cushioning system of choice from the last two Air Jordans. The IPS (Independent Podular Suspension) returns with a new feature – its visible. This time the IPS is color coded so the athlete can choose his cushioning for each pod with either a responsive, double stacked Zoom Air pod, or a shock absorbing encapsulated air. In addition to the custom fit cushioing the IPS provides, the Air Jordan 22 (XX2 or XXII) also has a Phylon midsole to provide extra cushioning without adding extra weight. The first thing one will notice about the Air Jordan 22 (XX2 or XXII) is how translucent the clear part of the sole is. The clear sole sticks to the court making it possible to make cuts and stops like no other. With a podular like outsole, one can make moves on the court better than ever before.